Join us on a scenic ride around Ontario's Cottage Country. The route boasts picturesque landscapes and long winding roads, always a hit with our riders. Coffee, Timbits and a BBQ lunch are included. The ride will be starting at North Simcoe Sports and Recreation Centre, 527 Len Self Blvd Midland, ON L4R 5N6. 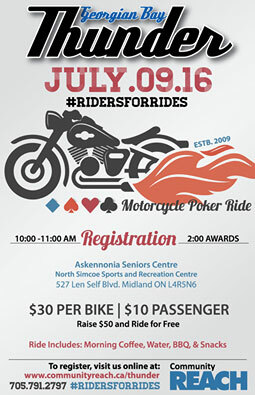 Riders will travel throughout the scenic Southern Georgian Bay area making 3 stops to collect their cards. Bikes return by 2:00pm. Awards and lunch start promptly. Your support of the 8th Annual Georgian Bay Thunder Motorcycle Poker Ride provides rides to community members without access to transportation.